John Alite has said that he reported to John Gotti Jr. and the Gambino family until he signed his deal to testify for the FBI in 2007. In addition, Gotti’s Rules says on page 183 that he spent 20 years as John Gotti Jr.’s muscle… Which, is total nonsense because John A. (Jr.) Gotti “chased” Alite from his crew, and therefore, the Gambino family in November, 1991. Did that mean Alite was no longer allowed in Queens? No. 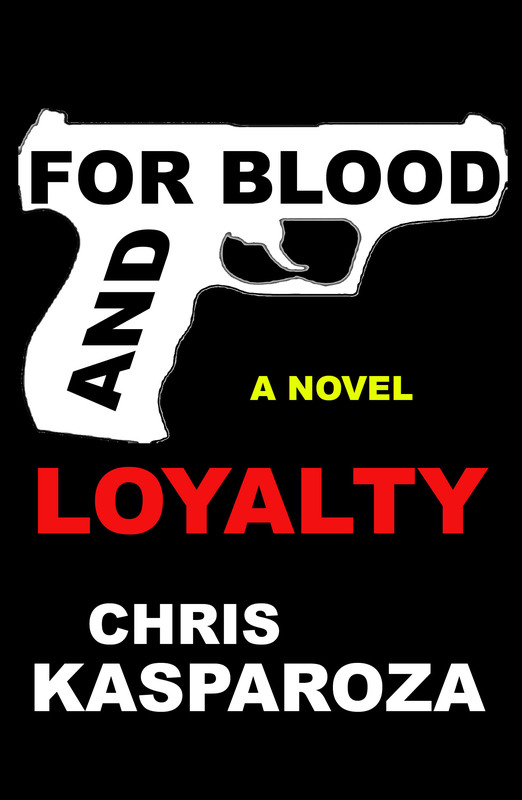 It meant he was no longer an associate of John A. Gotti’s crew and under their protection. It meant he was no longer allowed to do business with them or any other Gambinos. From that point forward John Alite would no longer be considered a Gambino family associate and have the organization’s backing, influence and support. 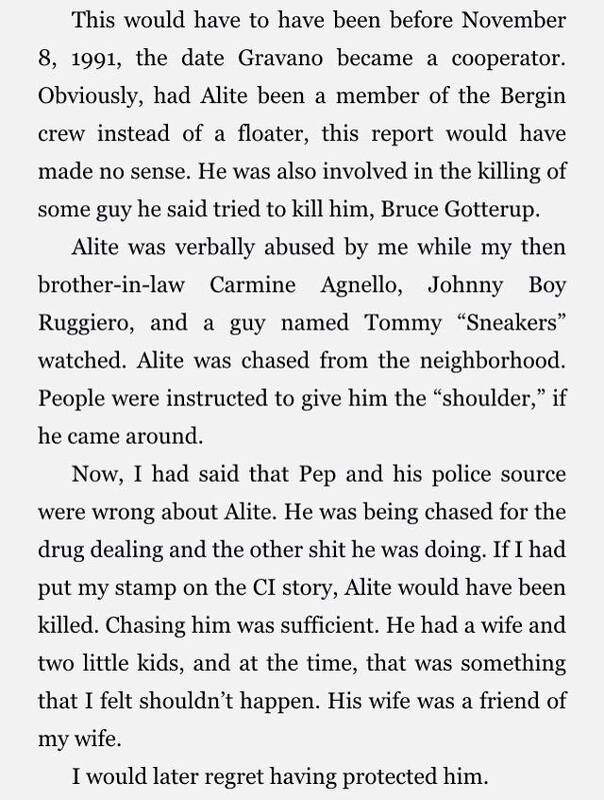 John Alite would now be just another thug instead of a very low-level mobster on the fringes of the Gambino family. But while John Alite denies he was chased, if that were true he would be able to disprove these allegations with one simple piece of evidence: SURVEILLANCE. Where are all the surveillance pictures or video tapes of Alite doing business with the Gambinos AFTER November, 1991? Especially with John A. Gotti, who, after his father was convicted in 1992 became a top target of the FBI, appearing on photo and video surveillance almost daily. Not to mention, where are all the audio tapes of other Gambinos in the area who were picked up on bugs mentioning that Alite was a player? 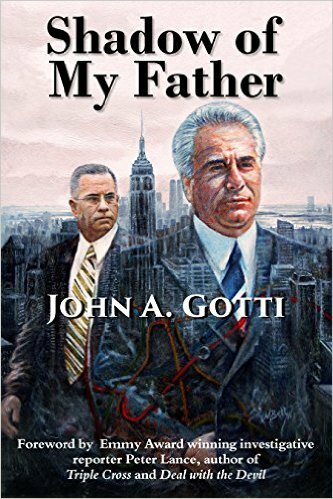 And why does Alite not show up at the funerals for John Gotti Sr.’s father in 1992 or John Gotti Sr. himself in 2002, the former of which was not just attended by nearly every free wiseguy in the tri-state area but by many more from around the country? The pictures of which would have been displayed at the trials where Alite testified to present him as a big-shot, as a more credible witness, and then most likely would have wound up in Alite’s book. Pictures which, if they existed, Alite would be able to access with ease due to his sources in the FBI and cooperation with the government. John Alite can not present any evidence of him associating with John A. Gotti after November, 1991 because it does not exist. There was no relationship between them after that point. Aside from a run-in John A. Gotti says they had in 1995 or ’96 at the Aqueduct Racetrack where Alite tried to surprise him to talk to him to try to get back in his good graces, upon which Gotti says he promptly told Alite to get lost as he wanted nothing to do with him, John A. Gotti says that after November, 1991 he did not see Alite again until he testified against him in 2009. 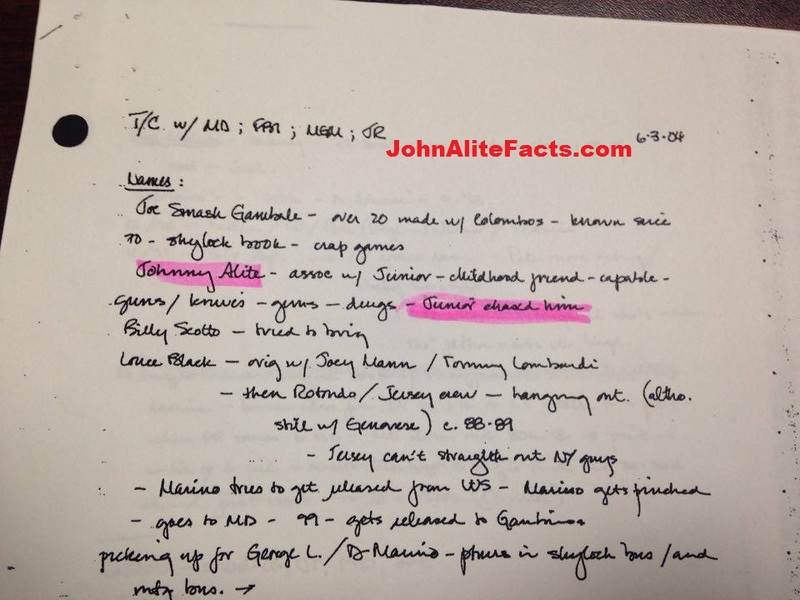 NOTE: This has DiLeonardo saying that Gotti and Alite were childhood friends, when, Alite says that they met in 1982 (when JG was 18) and Gotti says that they met in 1984. 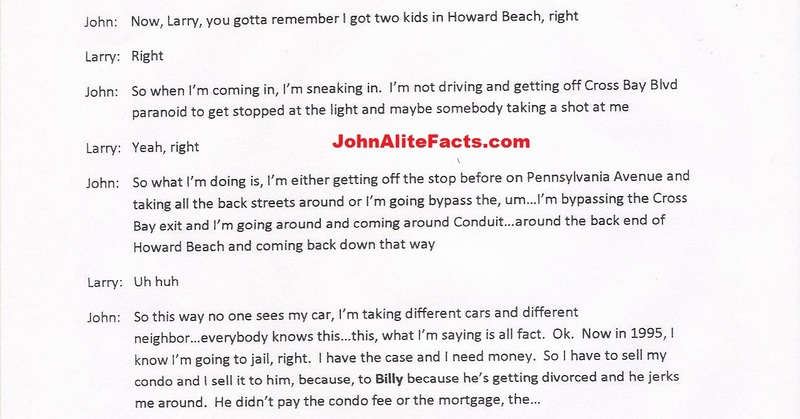 If John Alite was, like he said, a major mobster who was one of Gotti’s best friends and in daily contact with him why would he have been writing him letters in 1993 when he could have just phoned him or approached him in person? 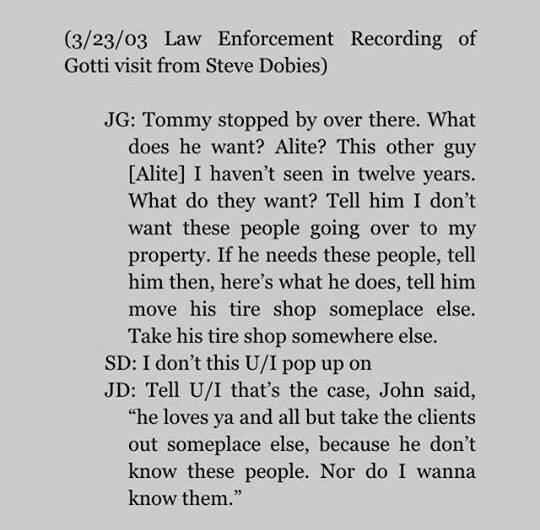 3- A wiretap recording made of John A. Gotti in prison at FCI Ray Brook on March 23, 2003 where he told his visitors that he had not seen Alite in 12 years and didn’t want him on his property. 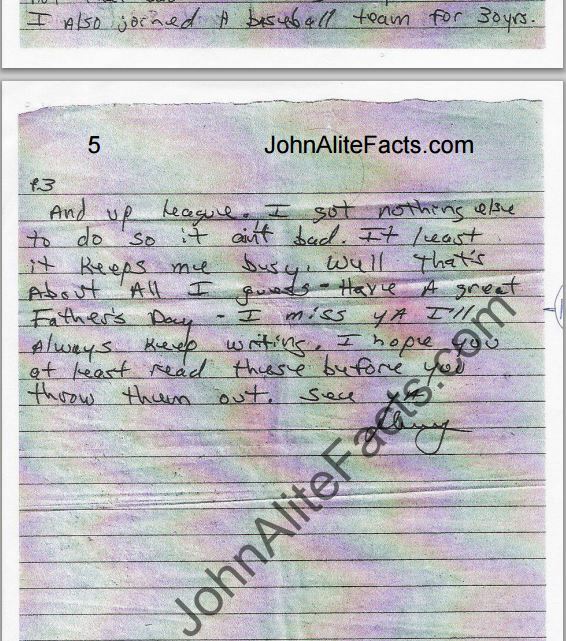 4- The following excerpts from a letter Alite wrote while in prison in Brazil (Alite, John 3506-191) to an associate in the U.S. where he is discussing the indictment he was charged with in Tampa which falsely listed him as a crew boss for the Gambinos. NOTE: Anastasia’s book also made no mention of Alite having parking lots in New York. 5- The following excerpts from Alite’s phone conversations with Larry Frost, attorney Joseph Corozzo’s private investigator who Alite spoke to from prison in Brazil to provide information to help Corozzo’s client, alleged Gambino captain Ronnie Trucchio beat his case in Tampa, Florida. See how above Alite was saying he was not with the Gambinos? Alite and Trucchio were indicted together in a 2004 racketeering case with several others in Tampa. The indictment stated that Alite ran a Gambino crew there which in turn reported to Trucchio in New York. However, knowledgeable sources have told me and the evidence suggests that Trucchio had zero involvement with what was going on in Tampa and got dragged into the indictment because he was talking to Alite when he was not supposed to, as Alite was chased. These sources said that Trucchio had a soft spot for Alite and that while he had no business relationship with Alite after 1991, Alite would still come to Trucchio with his problems and if he could he would help Alite solve them. 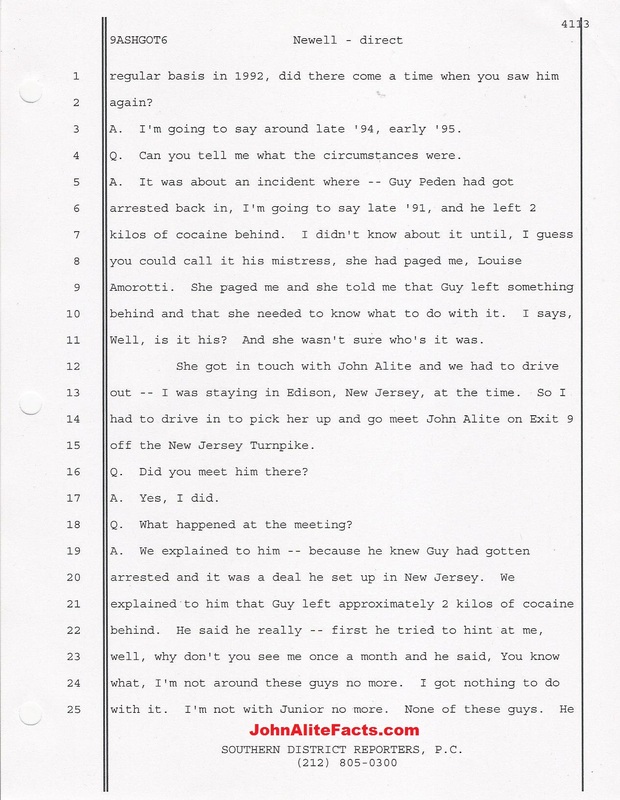 The reason for Alite speaking to the investigator was to provide information on potential witnesses, the charged crimes and to help separate himself from Trucchio as Alite had not been on record with the Gambinos for years and Trucchio needed to establish this at trial, to show that he had nothing to do with the charged crimes in the indictment and that whatever Alite was involved with in Florida, it was not at the direction of him or any Gambinos in New York. Yet even so, Trucchio was convicted and received a life sentence. NOTE: Aside from the life term in the Tampa case Trucchio is also serving 20 years from a separate conviction. 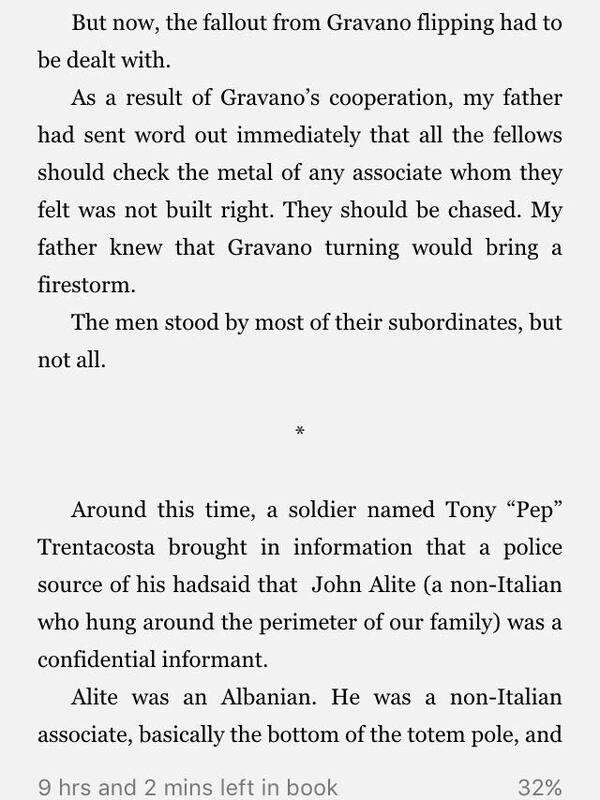 In fact, he was convicted of both cases before Alite was even extradited from Brazil in December, 2006, yet now John Alite badmouths Trucchio all over the place and claims that one of the reasons he became a cooperator is because Trucchio “ratted” him out first. The conversations were transcribed by Geri Russo. 6- At the 2009 John A. Gotti trial Stephen Newell testified for the defense that he no longer saw Alite in the neighborhood around 1992 and that in late 1991 Alite verified he was no longer with Gotti Jr. and the Gambinos. In a 4/22/2016 interview Newell said Alite told him this in either late November or December, 1991. To learn more feel free to contact Stephen Newell on Twitter @Stevo621 and or click on the images to expand the testimony. 7- At the 2009 Gotti trial alleged Gambino associate Joseph O’Kane also testified for the defense that Alite had been chased from the neighborhood. I encourage you to read more about him here: Joe O’Kane: A Man’s Man. 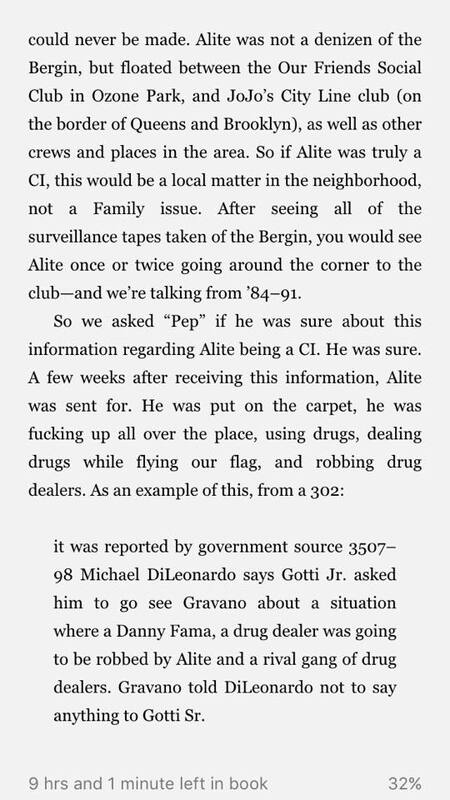 9- In an interview for this website Jimmy Alite, John Alite’s own brother verified that he was chased and said that sometime afterwards in approximately 1992 he even came down to John A. Gotti’s social club in Ozone Park to plead his case. Jimmy was worried that his brother was going to be killed and wanted Gotti to take John Alite back under his flag where he would be protected. 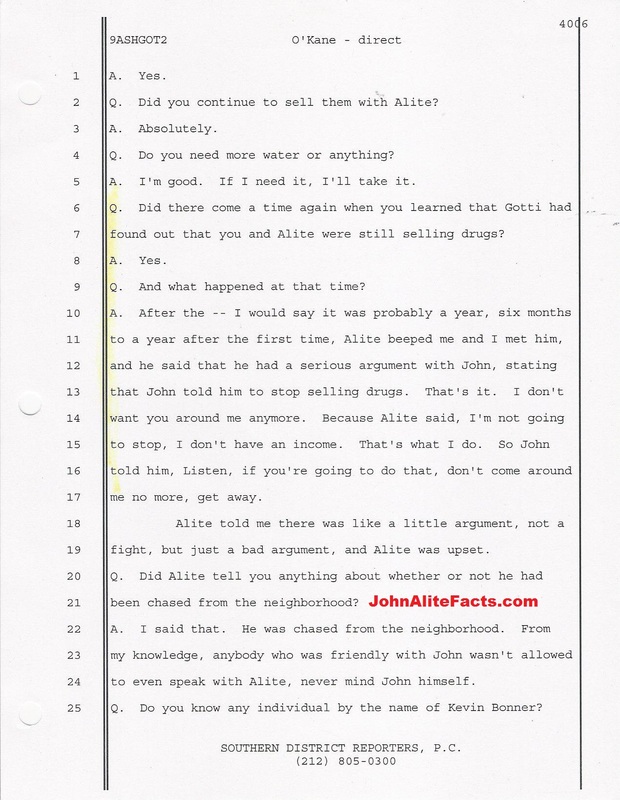 Jimmy said that afterwards he asked his brother about the rumor but John Alite neither confirmed nor denied it. He can be contacted at JimmyAlite.com. Question: Other than that run-in at the Aqueduct Racetrack in 1995 or ’96 can John Alite provide just one picture of him with John Gotti Jr. after 1991? ANSWER: Absolutely not, because, when John A. Gotti realized who John Alite really was in 1991 he chased him. He wanted nothing to do with him then and wants even less to do with him now. If there was a death penalty for lying, arat would have been fried by now. I believe once the gentleman investigating him is completed, reveals to the public what the goverment hid, #arat may have as well been below pelican bay having air pumped to him, he has no where to go but down. in the world today. Only reason Arat is sorry is because he has his rat trophy. Arat will never stop until he is back in the can, or on a witness stand against some other innocent individual, in hopes of more plastic surgeries & money. He will use the racince’s who swallowed his BS hook, line, & sinker, problem is none of the FBeye’s records support his fictional stories that #georgeanastasia fabricated with full knowledge. Once arat is back where he belongs, I wonder which of his fans will be putting money on his books for lil debbies & chips? What happened to his teeth ? Did he get them all knocked out while in prison ?